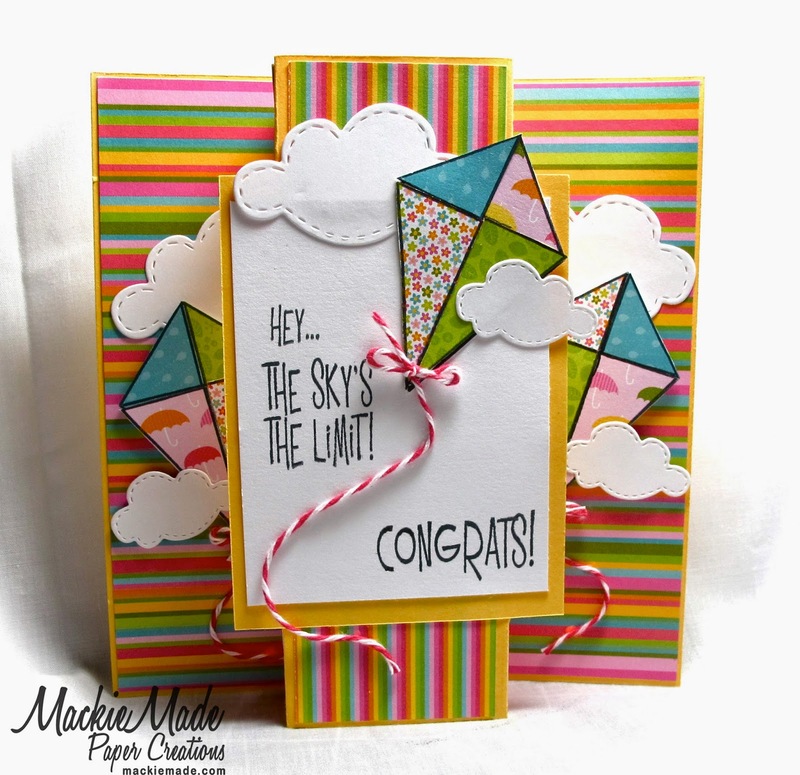 MackieMade Paper Creations: Sky's the Limit! Hello my crafty friends! I hope you all have been having a wonderful week! I wanted to share some information about a very talented, very FUNNY blogging friend, Darnell! You must start following her blog, not only because of her fabulous cards, but she can tell a funny story! 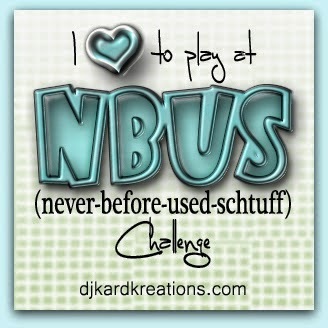 Darnell challenged herself several months ago to start using more of her "never before used stuff", therefore coming up with the phrase NBUS. And now...she has come up with a new Challenge! Isn't this a fantastic idea????? I couldn't wait to play! so I think it will qualify. It is a modified Tri-fold card. Now go check out Darnell's Blog! Oh my goodness, this is so stinking cute! Love the fun fold and the beautiful bright colors! Just perfect for those wonderful kites. Very creative and colorful. Love the Kites. What an adorable card! I like the bright happy colors. Haven't seen this card fold before...I really like the look of this design, the kites are perfect for it. You made an excellent choice with your card design and sentiment to honor Darnell. Whoever gets this will be holding a party in their hands, Mackie! It just EXPLODES with fun and celebration! What a really cool card fold and what a perfect design using those papers and kites and clouds and twine! Seriously awesome!! Wow, there's a riot of colour going on her, Mackie! Love the bright design with the paper-pieced kites and baker's twine strings. So bright and FUN!!!! I love the pp and the kites! So fun and cheerful Mackie! The kites are the cutest! 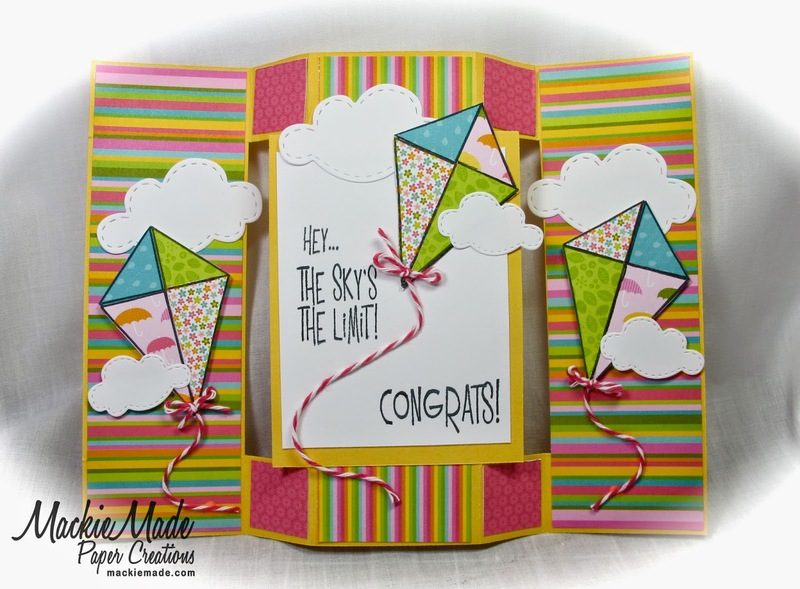 What a FUN colorful tri-fold card...love those kites! LOVE the tri-fold and the kites! FUN card, Mackie!